Quinns: HELLO! And keep your voice down. It’s me, Arctic Scavengers Quinns, from our Arctic Scavengers review! Contrary to popular belief I didn’t die at the 10:26 mark. Like all good cliffhanger TV you didn’t see me get shot, leaving the screenwriters free to bring me back at a whim. And we’ve got one heck of a juicy whim for you today. 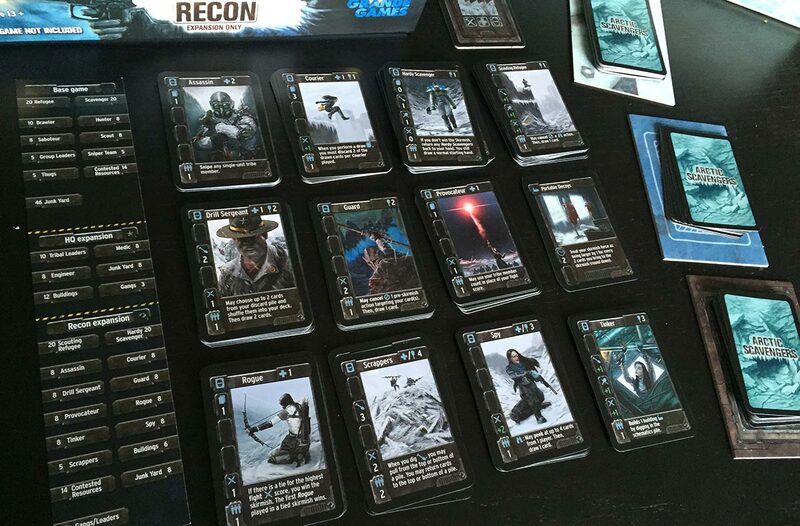 Arctic Scavengers: Recon is a big expansion for this phenomenal deckbuilding game of frosty bluffs, fully compatible with the “HQ” expansion in the base game. It’s also available in a box that combines Recon, HQ and the base game, which is quite the offers if this deceitful game slipped you by the first time. Do watch our video on the base game (and the gangs and cannibals of the HQ expansion) if you haven’t already, both because I won’t be covering it here and because it features a mint-condition Reference Pear from before the Fall. Below, you can see almost everything from Recon! Once you’ve thawed out your copy you’ll notice three things, in this order. 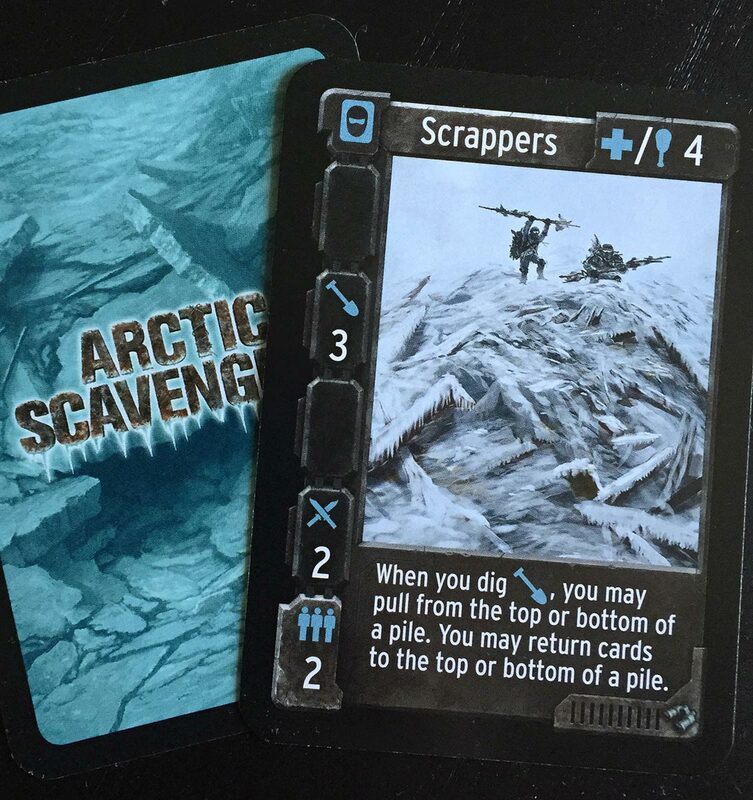 The fist-sized stack of cards contained within almost doubles the amount of cards in Arctic Scavengers. In so far as the art in Arctic Scavengers tells a story, the six years between the base game and Recon have not been kind to humanity. The Assassin, Guard, Scrapper and Spy all speak of a future where humanity isn’t just warring, but slapping on some impractical clothes and enjoying it. Finally, you’ll leaf through the manual to see about upgrading your Arctic Scavengers experience and possibly see that this expansion isn’t for you. Some expansions we recommend (like Cyclades: Titans, Suburbia Inc. or any of the add-ons for Cutthroat Caverns) attach comfortably and simply to the base game as if you were adding an extra wing to your house. Arctic Scavengers: Recon is a little more like adding a basement staircase that disappears down into total darkness. It adds not joy, but depth. 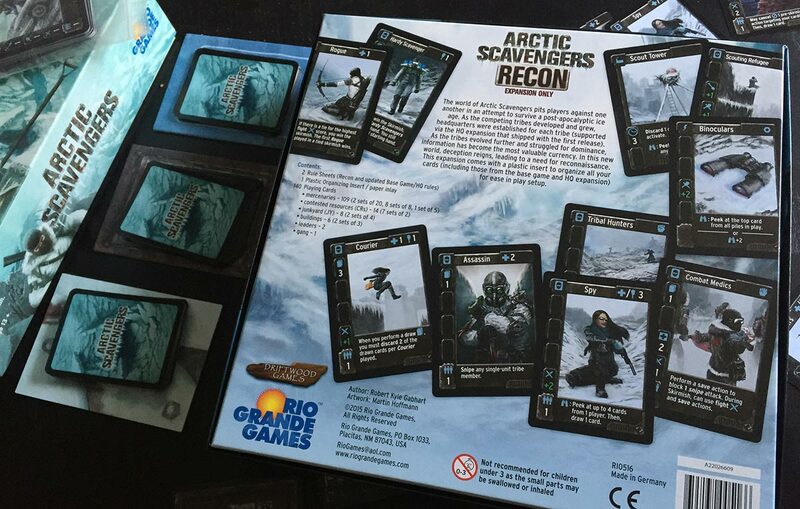 Recon does offer a few small pieces that can be added to any game of Arctic Scavengers. The Yardmaster and Swindler join the roster of potential tribal leaders at the start of the game, and the new gang of Humanitarians will join whoever has the most crap Refugee cards in their deck at the end of the game. That’s a lovely, impossible puzzle for you to dwell on. How many lost souls do you dare take in? There’s also frozen treasure trove of tear gas, cargo sleds, combat medics and more, which doubles the size of the Contested Resources deck all the players are fighting over. Before a game of arctic scavengers starts you shuffle this be-doubled deck and put half of it back in the box, et voilá! You have no idea what prizes will show up in each game. Neat. But this lateral expansion stops here. 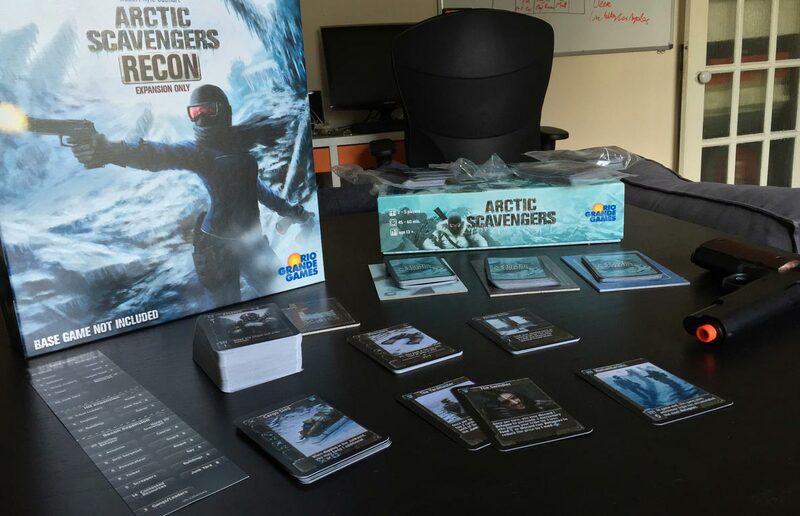 When we called Arctic Scavengers a near-perfect game, it appears designer Kyle Gabhart agreed with us. 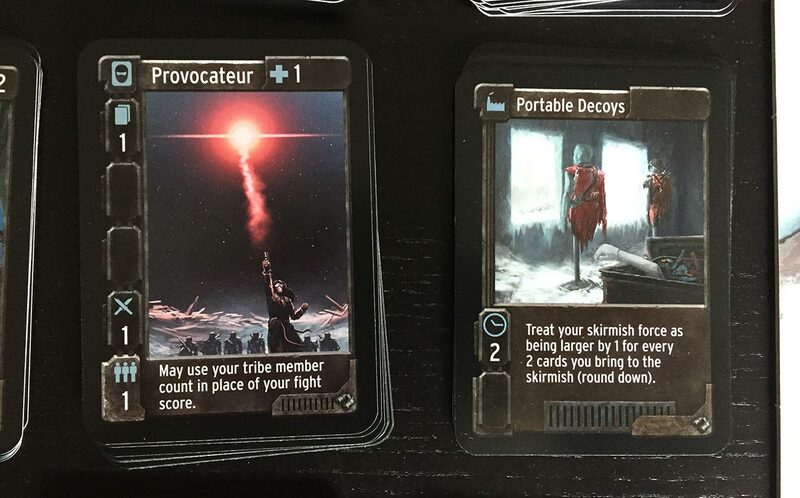 The rest of recon’s 140 new cards only arrive in the game by dislodging existing cards, like a gang of trained killers forcing the base game’s families and scavengers out of town. 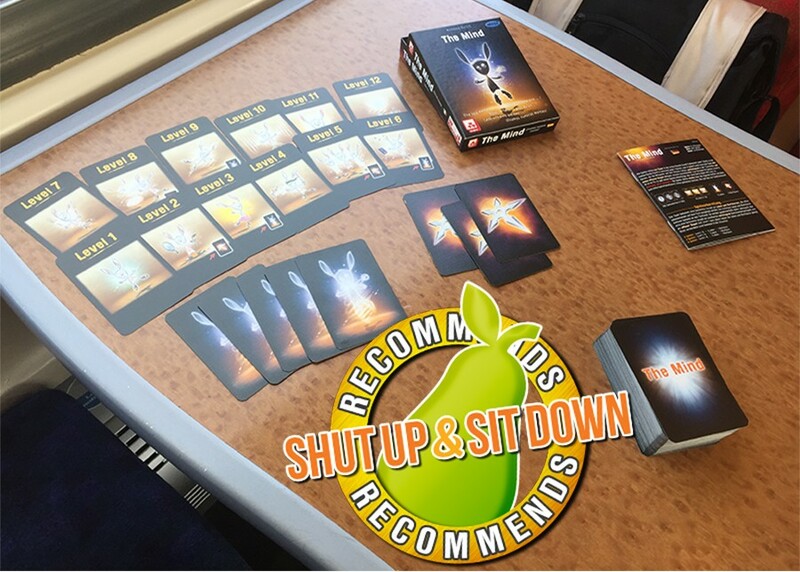 Changing up the “shop” of cards available to players works well for other deckbuilders like Dominion, Thunderstone or Trains, where spotting combos in the shop is the game. But Arctic Scavengers is a little more complicated. As anyone who’s played it knows, you don’t finish a game and want to try out new cards. There’s so much delicate interplay between the different decks and mercenaries that you’ll want to try it again, knowing everything you’ve learned. You won’t want new cards right away. Which means you won’t want to play with Recon’s modules right away. And if you’re the kind of person who only plays your games rarely, you might never play with Recon. Ever. This box is for people who play this game a lot, and who’d consider themselves good at it. Tell you what, though. Those people are in for a treat! Module #1, “Spy Hunter”, adds spies and binoculars to Arctic Scavengers (after you’ve pruned back the junkyard pile and remove another mercenary stack from the market to fit them in). 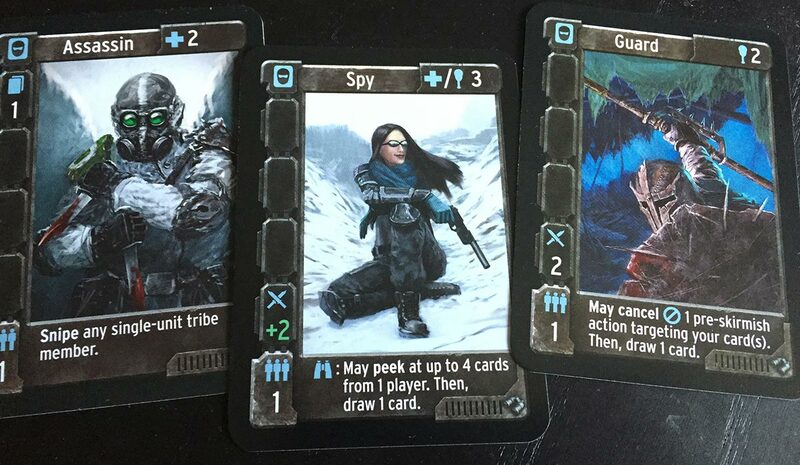 Your reward for this is nuts- Binoculars let you secretly look at the top card of the Schematics pile, the Junkward or even the Contested Resource pile, letting you load the dice in Arctic Scavengers’ metaphorical crapshoot. Spies are even crazier, letting you look at four cards from a player’s hand, deck, even inside a building. It’s a ton of fun. Anytime anybody uses it there’s a sense of them breaking the cardinal rule of Arctic Scavengers, and you hate them for it. But the question is (and again, it’s an impossible one) when it’s preferable to take intel over just heaping more vital resources like food and guns into your deck. Module #2, “Liars and thieves”, adds assassins, provocateurs, rogues and guards to the mercenary market, sending another four stacks of mercenaries back to the box. 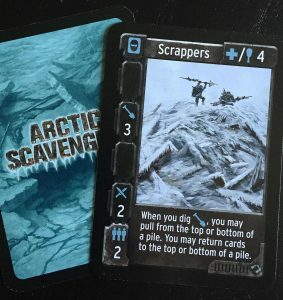 If you had a tactic for winning Arctic Scavengers’ skirmishes (going heavy on snipers, say), you don’t any more! The guard can put a stop to snipers and saboteurs, and the provocateur turns a crowd of non-combatants into a terrible mob, letting you replace your “fight” score with the number of tribe members in your hand. Module #3, “Expanding the Ranks”, replaces the old mercenaries with a few that let players get clever with their decks. The new courier lets offers an unparallelled ability to draw through your deck, but you have to discard just as much. The shouty Drill Sergeant can take spent cards in your discard pile and pull them back into your hand. Scrappers (who I think are Tuskan Raiders who’ve gotten very lost?) can not only draw from the bottom of the junkyard stack, they can put crap cards back on top of the deck to get in everyone’s way. Nothing intrinsically funny here, but lots of stuff to goad experienced players off the beaten track. It’s not just that any one (or two, or three) of these modules will lead to a radically different game. 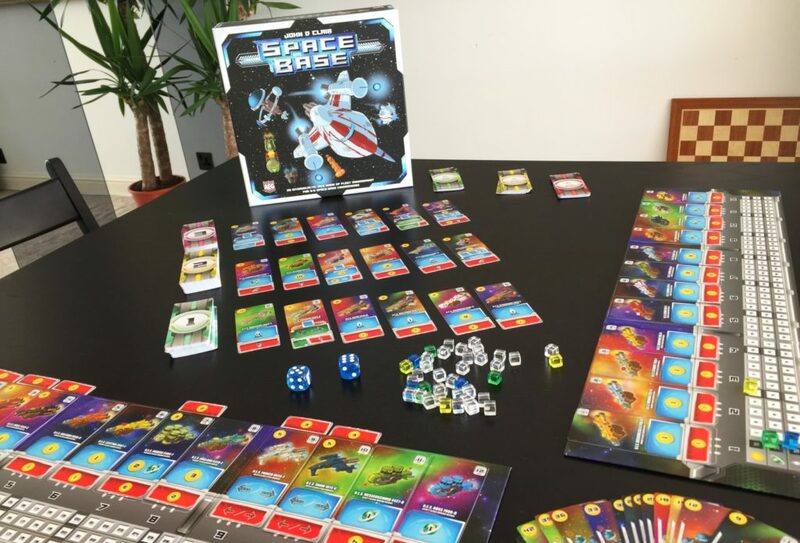 Arctic Scavengers is a game where groups can easily fall into patterns. It’s such a fierce contest that players might be a little less willing to experiment than they would in other games, because the cost of failure is so obvious and painful, whether it means losing a skirmish, losing momentum or losing a card, all of which snowballs into more losses in the future. In addition to mixing things up, Recon acts like a toolbox that can fix all that. 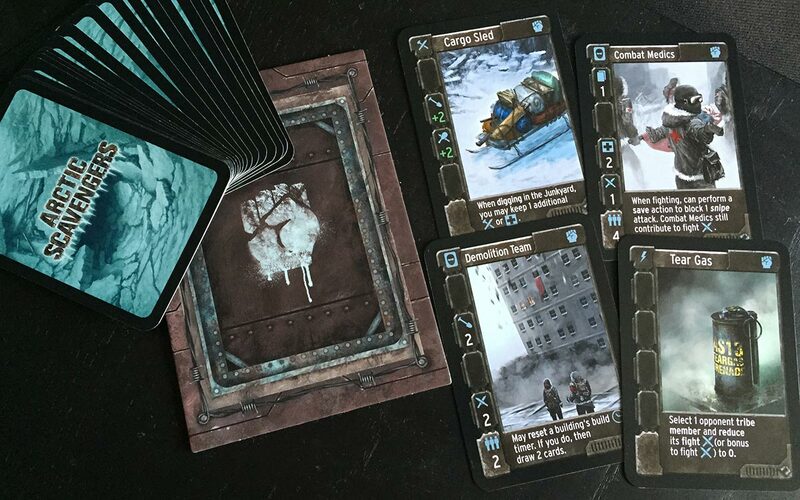 Whether your group goes diving into the junkyard, buys up all the snipers or throws all their refugees in a snowdrift on turn one, it offers cards that can make that exact strategy less viable. Adding new cards in most deckbuilders is like trying a new flavour of ice cream. In Arctic Scavengers, the addition and removal of cards should feel closer to telling someone to clear a snowdrift, but first breaking their shovel in half. So, is Recon for you? Only if the base game feels a bit tired. 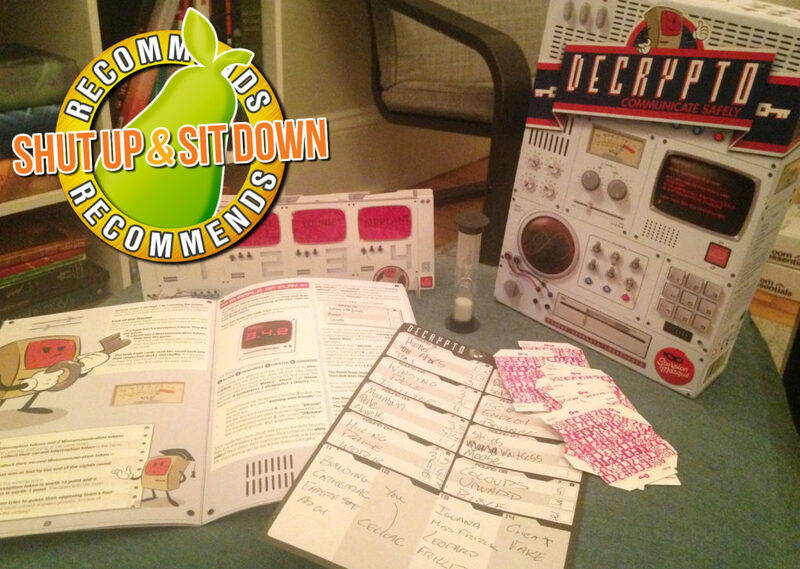 But I’m happy to say that the Base Game + HQ + Recon box is almost a no-brainer. If you’ve been on the fence about this one (I imagine you with a grappling hook slung over the top of the fence, grenade in hand, the enemy tribal leader delivering a passionate speech his refugees on the other side), now’s the time to strike.